I swear I will have a giveaway up soon! I'm trying to work out a few things but, I hope to have 1 up tomorrow and then another next week..and maybe another later on. :X I went a little overboard getting things and after I had everything it was a little overwhelming! I love this time of year and gifting others is way more exciting than getting things myself. 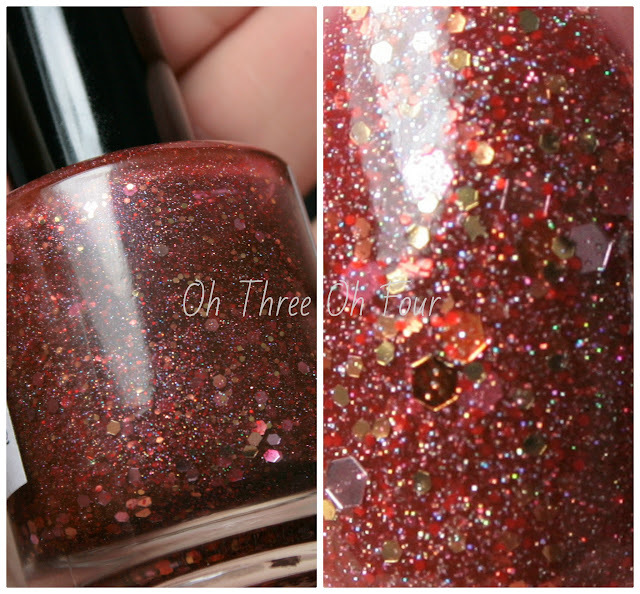 :) Anyways, I have a quick post for today with not only a polish from LynnBDesigns, but her lip balm as well! LynBDesigns Shadow On The Moon is described as having a sheer darkened red base with pale pink and pale orange small hexes, microfine silver holographic glitter, and small gold hexes. With the exception of my ring finger, all nails are 3 coats with a top coat of Seche Vite. My ring nail is 2 coats of Shadow On The Moon over 2 coats of Wet n Wild Ebony Hates Chris with a top coat of Seche Vite. 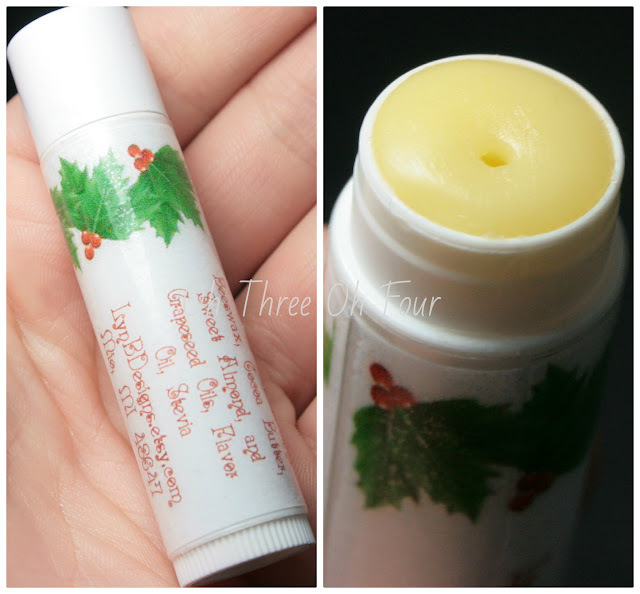 LynBDesigns' lip balms are made of natural ingredients like beeswax, sweet almond oil and grape seed oil. Candy Cane is a blend of vanilla and not only smells amazing, it is a great consistency that's not too heavy but still moisturizing. Unfortunately, Shadow On The Moon is discontinued but LynBDesigns carries a variety of polishes, which all on sale right now for $5, and other products in her esty shop here. Make sure to follow LynBDesigns on Facebook here, she currently has a giveaway running on Facebook so make sure to enter!